Slice of Life: Messing up on Social Media - How do you fix it? Messing up on Social Media - How do you fix it? We all do it. A misspelling or typo on an important Tweet or post. The little things you can easily delete or edit and hope not too many people noticed that you misspelled the word "pizza." We are all human and it happens. But sometimes, those mistakes can become a nightmare for public relations. When we let emotions get the best of us or try a racy promotion that backfires, or even use the wrong hashtag, it can make a huge impact on your brand. Here are three examples from this year and how they handled it. We would like to make an apology to those that were offended by our recent post and thank those that have been supporting us. We have worked for nearly three months bringing a fresh new restaurant offering to the area. After only 9 days of being in operation coupled with the fact that we had been working almost 16 hours per day for two weeks straight we wanted to set the record straight that we were not trying to replicate Tobey's yet most people first comments were Tobey's this or that - comparing us to them. We are Rocko's not Tobey's plain and simple. The post was taken down after we realized we had posted it out of frustration and tiredness. I do not want to hide behind that as an excuse but that is what happened. The person that got a hold of the post had formerly worked with one us and although we are not quite sure of her exact intent we feel it's only intent was to harm and hurt. For those of you out there in business perhaps you have a better understanding of the stress that goes along with starting an operation but for those of those that don't you have no idea. We are currently responsible for the livelihoods and incomes of 23 people not including ourselves. These people will spend their money in our community at other businesses and help keep other businesses going. Please consider your actions and their affect. We have learned our lesson from this incident as well. Thank you for taking the time to read this. While the original post was removed, the apology remained up which led us to add this into the mix. Whatever drama the original post had, the owner felt the need to provide a heartfelt apology for it. What they did right was to mention they have learned their lesson and to apologize and thank customers. But admitting they were wrong was a good step in the right direction as well. Tip #1 - Don't post when tired or frustrated. If something in the back of your mind wonders if you should post it, then don't. Hold out for a day or at least a walk around the block. Get a second pair of eyes on it if needed. And always, always avoid going negative. 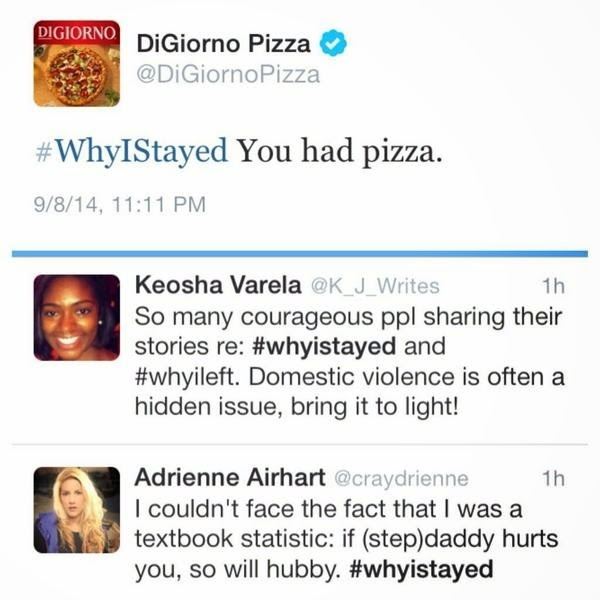 Since this just happened, the fall out is still unclear, but DiGiorno's has spent a lot of time this week apologizing repeatedly. Their excuse is that they didn't know the hashtag reference. If true and not just a way to try and get out of it, then that leads to a very important tip. What they are doing right is not just the first blanket apology, which happened within seconds, but repeatedly apologizing to each individual who comments on it. If you screw up like this, take the time to be mindful of how it hurt people and put effort into the apologies. It may just build up some good discussion on an important topic and help rebuild customer trust. Tip #2 - Always check meaning of hashtags and click on them to see how others use them before trying to insert your brand name into it. While the sign should have read "animal kit" or so we are now told from Pets Story, the fallout on social media was much larger. The deal was offered by a franchise in conjunction with a local pet store but after people attacked the pizzeria's Facebook page was pulled. 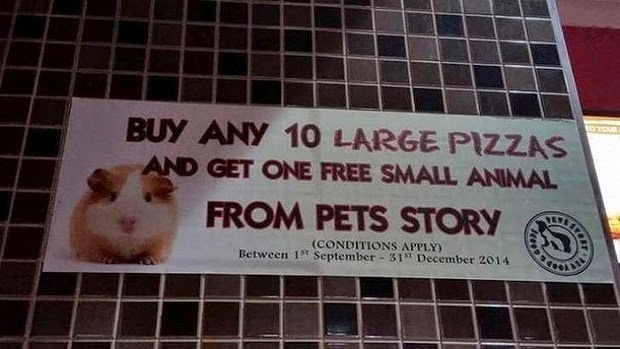 One user wrote: "Shame on you Pizza Hut for offering free pets. Have you any idea how damaging to your brand and reputation this is? Please stop this shortsighted and WRONG offer". Another Facebook user said she was worried the animals would "end up hurt, dead on mistreated." According to The Age, Pizza Hut corporate responded with this: "It has come to our attention that one of our stores have recently been running a promotion which was not approved by Pizza Hut Australia, nor was condoned in any circumstances. We would like to sincerely apologise to anyone who was offended by this. "The poster has since been taken down and all those involved have been made aware of the severity and inappropriateness of the promotion. We would like to thank Oscar's Law and all those who have brought this to our attention this evening." Well, I suppose that is one way to apologize by throwing your franchisee under the bus. But perhaps Pizza Hut should have coordinated with the response from the Pets Story who said that it was a misprint and there was never an intention to even give away animals. So now, which story is true? An apology gone wrong as it is hard to know if anything has really been resolved or learned when the different parties are spouting different things. Tip #3: Look back up to #1's honest apology. Be honest. "We screwed up but we learned through this great organization why what we were doing is wrong and we've learned. We are sorry. Please forgive us and thanks for still following us." Or at least, tip aside, get your stories straight when multiple parties are involved. While not every minor error on social media will lead to national or international media coverage, the bad buzz is not so hot for those that end up with it. Be mindful of little things like misspellings and commas when also considering your content because it all equals up to whether a customer can trust your brand. If you misspell the word mozzarella, how can I trust you to even get it onto my pizza? If you say something out of anger or make political assertions on your brand's page, why should I spend my money at your business if you don't take the time to admit your mistake and work to fix it? When all is said and done, while you should be careful, don't give up on showing personality with your social media. Remember, it is about connecting with others and your customers want to see you shine through, just make it the best you they can see.